Over the last six months or so, the introvert/extrovert discussion has just blown up online. And personally, I love it. The difference between the two isn’t just a matter of loving to be at home alone with your books vs. wanting to party all the time. For example, I’m an introvert, but I’m not a hermit. I enjoy spending time with friends and can even be a lot of fun at a party (so long as I’m prepared and in the right mood for it), but it’s always a bit draining, and I need some time alone to recharge before doing it all again. Basically, I can sparkle like a damn unicorn, but I have a finite amount of sparkle before I’m out. And once I’m out, well, you’ll know it. Anyway, understanding this part of ourselves can explain some of our likes and dislikes. For example, do you love trying new and different yoga DVDs at home but find yourself wanting to just crawl into a hole and die zomfg DIE when you go to a yoga class and the instructor actually comes over and adjusts your posture? (Yes, I’m raising my hand over here … while shuddering with anxiety.) Yeah, you might be an introvert. Just because you’re an introvert doesn’t mean you should always work out by yourself and never partake in group activities. 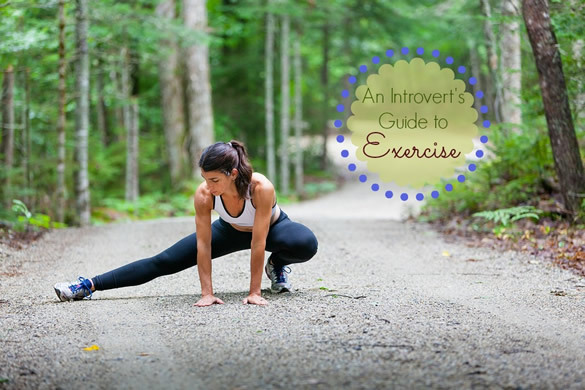 Lots of introverts I know really dig structured interaction (like in a work setting), and your workouts can be just that. With that in mind, below is a brief, not-even-close-to-exhaustive guide to exercise for introverts for New Year New Rear Week! 1. Exercise alone. It’s kind of a no-brainer, but let me just say that there’s no shame in this. If you prefer to exercise solo, then do it. If you set a 5k PR in the woods and nobody’s watching, did it still happen? DAMN RIGHT IT DID. 2. Find workout buddies who “get” you. Want the accountability of a workout partner but can’t deal with making idle chit chat while you run or spot each other? I bet your close friends would understand, especially when you make it clear that it’s definitely not about them. I know mine do. And shoot, you might even find someone who doesn’t want to make smalltalk with you, either! 3. Find the right group exercise for you. If my mention of the hands-on yoga instructor above made you break out in a cold sweat, or if you can’t handle the hooting and hollering that comes along with some Zumba classes, don’t swear off group ex altogether. Some classes, like Spin, are great — everyone does his or her own thing and there’s no inter-student interaction, really. And I’ve participated in some pretty solitary Body Flow classes. And remember, a lot of this will have to do with the instructor, so if it’s important to you, ask the front desk about instructors for classes you’re interested in. I bet you won’t be the first to specifically seek out instructors known for never calling out their students. Bonus — you just might find an instructor you love who teaches other classes! I’m completely an introvert but I’ve been surprised how much I love group fitness through November Project (a free “grassroots” workout group that started in Boston and now is in 7 cities). I was nervous going at first but quickly found how friendly everyone was and the group has helped me come out of my shell. My tip is to know that you aren’t alone feeling intimidated and exercise brings out the best in people so you’ll be welcomed with open arms if you give it a chance! The hard part for me is overcoming my shyness and anxiety (and I’m fairly uncoordinated), so although I have a desire to go to Zumba and boot camp classes I usually talk myself out of it. I really need the accountability and encouragement from group classes since I don’t have much support at home. Ugh. I really find that I love to work out on my own and have been doing it for a few years now. I was resistant to join a gym because I figured I could get all of my work out needs met at home. Now, while I still love working out at home and have come to a point where I can put together a nice work out routine, I recently joined a gym and feel that I have a whole new set of options when it comes to working out. The one thing I like about working out with others is that, even though I may not be as talkative as I may one day be, I learn about new workout techniques by watching what other do in the gym. Just by being there I feel my work out skills are improving by exposing myself to new ideas. Any ways, those are my two cents. Thanks for the post! Thank you for this article! I am an introvert and so chose swimming as my main fitness activity. I’ve lost 30+ pounds so far and have now signed up for a city run yoga class (not a fancy class, but a good one). I figure the more weight I lose and the higher my fitness levels go I will perhaps be more inclined to join in activities with other people. But, yes, the whoopin’ and hollerin’ in the Nia class is not my cup of tea. So far I have enjoyed talking with other women who swim for fitness like I do and I do not enjoy small talk about grandkids and the weather. Some might consider me almost unfriendly but I don’t care. I’m there to work out hard and if I’m not working out hard then I’m just cheating myself and wasting my own time. I can’t wait to add other activities to my life such as hiking, cycling, kayaking, snorkeling and SCUBA diving. I really liked what you said about having limited sparkle. I’m that way too. I can shine when I need to like when giving a speech or working a room for some important event, but this power is limited (like picking up the star in Mario Kart. When you have it, you can push cars out of the way, but when it’s gone, you’re simply deflated). Regarding working out when I’ve gone a while being lazy or I just feel like being by myself I go back to the basics with Leslie Sansone Walking Off The Pounds videos. Yes, their kind of cheesy and dated, but they’re all over Youtube and her personality is definitely infectious. It’s like a good ole dose of golly gosh darn fun. I do the 3 Mile Walking Workout and despite its low intensity it never fails to get me feeling great by the end. Actually, often I finish it and then feel like heading to the gym for a good treadmill run or seated rows. The key here is that it has such a low resistance threshold. You start off just walking on the spot and before you know it, you’re sweaty! What an interesting conversation. I too love all the info out there now, about introverts. I dont lean towards group exercise either. I like to walk, especially out of doors. Or walk with just my husband or good friend. The wellness center where I work out has really cheap prices for a personal trainer. I work out with her every week. I love it. Its one-on-one, no one to compare myself to, great motivation, and pushes me harder than I would myself. Its perfect for my introvert. You don’t sound very introverted, just not as much as really introverted people can be. For me, exercising alone isn’t very possible since I’m not a stage in my life where I can afford to live entirely alone and the thought of someone walking in on me is very off putting. I live in a family of extroverts so I love the rare moment I have alone. I know I need more specific examples of how to exercise alone or else it wouldn’t be an issue. I think many of the people looking for help are the people who aren’t satisfied with the current options for exercise. I have many ideas of ways to exercise, but I’d need to be a millionaire to afford the facilities it would take on a private level. I think of things like parkour, gymnastics, trampoline work, indoor rock climbing ect. but I don’t want to have other people seeing me while I do it or have to make the trek across town with proper dress and mood. I’d like to jump in a pool with my clothes on or practice gymnastics in a dress or climb without the feeling that there’s someone on the ground with my rope watching me struggle and judging me and wanting me to hurry it up already. I want to be able to take breaks as needed without feeling the people around me knowing I’m not up to their pace. 🙁 If I had my own flat and a Wii fit and maybe a stripper pole for dancing/climbing I think I could be good but that’s a lot of money to put out as a student.